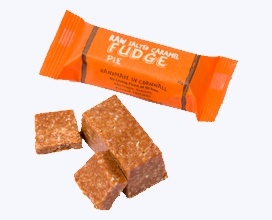 To celebrate our Raw Salted Caramel Fudge Pie winning a Silver award at the Free From Food Awards last week, we are offering you a very special gift. For the month of May only, we will be giving you a free Salted Caramel Fudge with all online orders, regardless of how much you spend. We sold the first batch through our St Ives shop in less than 4 hours. The winning combination of the sweetness of the caramel and the subtle saltiness of the pink Himalayan salt is truly delicious. The judges said, "Brilliant! Close enough in texture to fudge, lovely caramel flavour. Great ingredients & very good price for quality. I would certainly buy it." We are sure you will love it as much as we do!